Year after year, NFBD produces one of the largest All-Star Football Showcases on the East Coast for High School seniors. The Game consists of 70 Division I & Division II commits from 10 different states. These young high school seniors will be motivated, encouraged & coached from the sidelines by current Division I athletes, as well as current NFL players. They will all be in attendance to help spread the central message: Never Fear Being Different. Last year, current Los Angeles Rams Defensive Tackle & 2017 NFL Defensive Player of the Year, Aaron Donald along with the Pittsburgh Steelers first round draft pick, Terrell Edmunds attended the game. On top of that, 30 current Division I players from various schools were also in attendance. Many of them are expecting to be eventual NFL Draft selections. What’s the Problem? High school athletes are often inspiring to many people and these athletes’ spheres of influence are constantly seeing rapid growth. This especially applies to high level athletes, some of which are already verified on Twitter. These high school athletes even serve as role models to adults, but more importantly to children across their communities & social media platforms. They develop these huge platforms & influence, but never seem to receive proper guidance on how to leverage it most effectively. NFBD recognizes the potential for these individuals to lead & have a positive impact on their peers. The Solution: You may be wondering, how is a football game going to change the way athletes choose to use their platforms? Well, this is more than just a game. The athletes participate in a week of workshops & practices where they will learn: How to effectively use their platforms/influence & how to successfully not fear anything. The workshops are centered around role model development, effective online leadership, personal branding & emotional intelligence. This year will mark the first year that NFBD will be providing a FREE kids camp, an NFBD benefit dinner, as well as panels & keynotes held by current & former pro players! Through these panels & keynotes the participating athletes will engage in positive conversation on social impact & responsibility in sports. Gametime: The aforementioned practices & workshops are followed by the game. 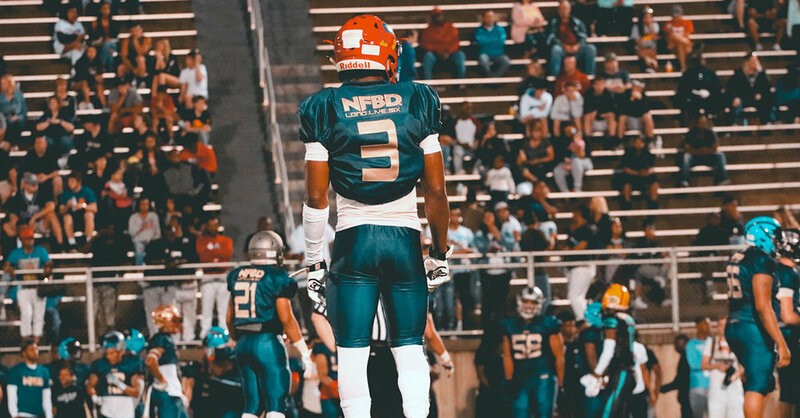 This year will mark the 4th year of the NFBD All-Star Football Game, where the top high school seniors from 10 different states will compete in a competitive football game. Each year, attendance & social media numbers have grown exponentially. The game will attract a large audience. It’s also an appealing event that offers viewers entertainment that is being centered around a positive message. Product: Large game attendance, improved social media numbers & players that leave as better people, simply by — Never fearing being different. Jordon encourages athletes to love doing the things that average people hate to do. He challenges them to turn their grind into an everyday lifestyle by adjusting their daily habits to align with their goals. Jordon wants to change their lives, but in a cool way!